Announcement PLEASE READ ALL SHOP POLICIES BEFORE ORDERING A CUSTOM ITEM! LaDiDa Lady Hats are custom OOAK and so much fun to wear! All of my hats have a head circumference of 21-22 inches. Hats are not sold without a monogram or name without prior approval. MONOGRAM ERRORS THAT I MAKE WILL HAPPILY BE REDONE ON A NEW HAT! MONOGRAM ERRORS THAT YOU MAKE BECOME YOUR FOREVER HAT. THEREFORE, PLEASE CHECK YOUR DESIGN PROOFS CAREFULLY. Thank you for shopping with me! We offer many custom embroidered items for you and your gift giving needs. Sorry, but I do not sell wholesale nor discount my hats. If you choose not to take advantage of the extras offered within the sale, the price remains the same as listed. My hats come in many styles and prices, hopefully, to suit everyone's budgets and preferences. When placing your monogram or embroidery order, please check your spellings and instructions carefully, because once sewn, the stitches cannot be removed without damaging the item. Monogram proofs and design work are not provided prior to sale. Monogramming is always available! Some of items are handmade and some are ready made and then upcycled or monogrammed and personalized by me to make that "something special" just for you! Refund Policy: We do not accept returns since these are "worn" items. 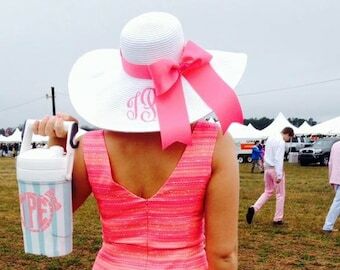 Even if the hat is not monogrammed, it is still considered "worn" and therefore, cannot be resold. If I make a blunder, I will happily fix the issue. If you submit incorrect monograms, name spellings, colors, it will become your forever hat. Therefore, please double check your order. IMPORTANT PLEASE! We only ship to CONFIRMED credit card and paypal addresses. If your address and/or account name is not confirmed or verified through either paypal or your cc company, please confirm it before submitting order or we cannot ship. Please check your shipping addresses carefully. I am not responsible for shipping address errors nor USPS non delivery. PLEASE READ ALL SHOP POLICIES BEFORE ORDERING A CUSTOM ITEM! 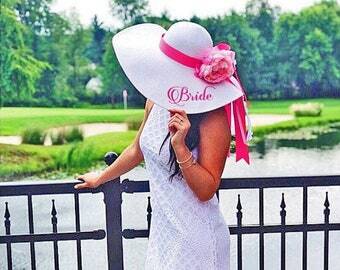 Personalized Floppy Hat Package White - Natural Embroidered Mrs. & Bridal Party Hats Wedding Party Bridesmaids FREE SHIP More COLORS! 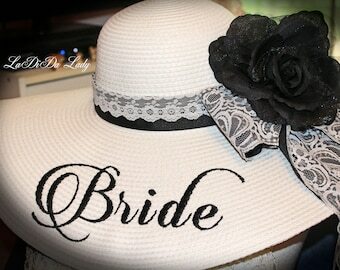 Monogrammed Floppy Hat Black & White Lace Bridal Bride shabby Chic Wedding Derby Cup Race Custom sewn ribbons . OOAK NEW ITEM! Monogrammed Shabby Chic Floppy Hat Bride Wedding Easter Derby Cup Race Custom sewn ribbons w lace & florals Blue and Pink OOAK NEW ITEM! Navy & White Monogrammed Floppy Hat! Nautical !! It's Derby and Cup Race Time ! Derby Time Is a Fun Time! OOAK handmade statement jewelry. Perfect for Brides! Derby Hats, Bridal Hats, Mrs. Hats! LaDiDa Lady Hats - For the LaDiDa Lady in YOU! My shop was started with my love of PINK things! Over the years, I found that so many of my ladies were as frilly and prissy as I am. It all began with a hat or two. Suddenly, I found that so many ladies wanted their own personal pink! Now, several years, and many thousands of stitches later, I have grown into a full service embroidery shop. I am now adding custom jewelry! Upcycling old fabrics, flowers, ribbons, laces, jewelry and items into something new & fresh is both good for the earth and so much fun and rewarding. Vintage and vintage inspired items are so beautiful and should not be forgotten. I try to never miss an Estate Sale where I am always on the look out for vintage ribbons, laces and jewelry from days gone by. Each person has their own idea of how they would like to be perceived. I love to help you achieve your wish. I am addicted to pink, vintage inspired, shabby chic, upcycled, prissy girl & custom items! Let me help you achieve your LaDiDa Lady inner self :) It's fun and just makes you smile. Welcome ! We hope that your shopping experience with us will be happy and fun ! All items that are ordered are sewn with customer satisfaction in mind. We hope that our items are as beautiful to you as we hope they are :) We want you to be proud to own our items. Thank you in advance for your patronage. It's always "just another day in stitches" at LaDiDa Lady Boutique.